Mud, mud and more mud! 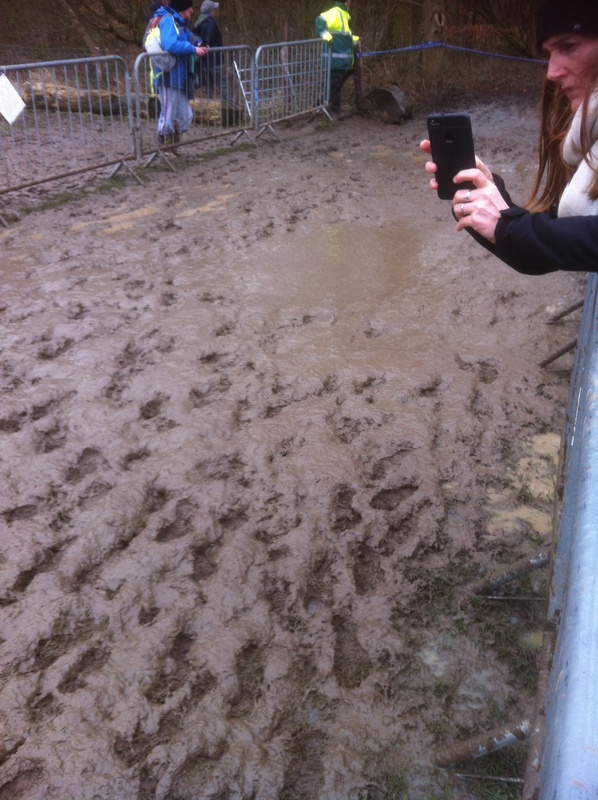 That’s what greeted the North East Counties cross country team for the Inter Counties Cross Country Championships at Prestwold Hall, Loughborough on Saturday March 10th. The Poly had three athletes selected for the championships (with another five runners narrowly missing out on selection) with every one of them doing themselves, their County, their families and their club proud. 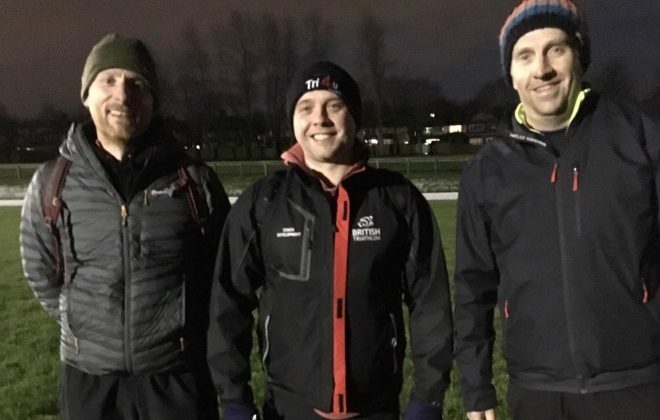 The teams were selected from performances at the North East Championships at Redcar back in December and the Northern Championships at Leeds in January. Eight athletes were selected for every age category, with 4 to score in the Championship races. 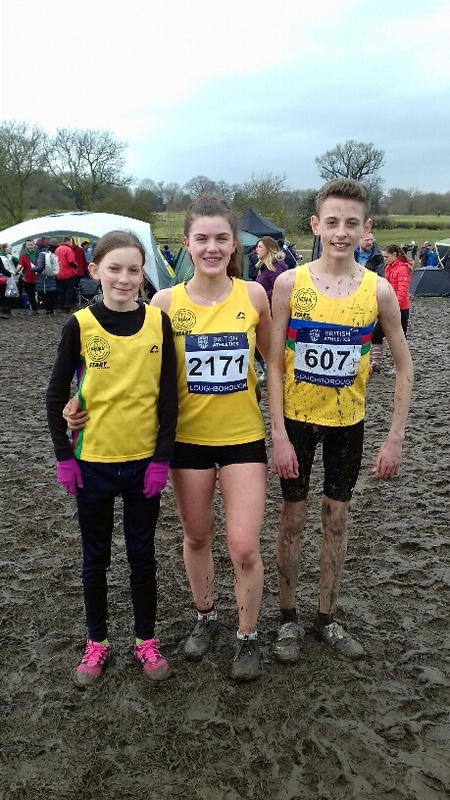 With the strength in depth that the North East has in every age group, just being selected for these Championships was an achievement in itself but that is exactly what Josh Blevins, Issy Robinson and Lily Robson did. First off was our very own Northern Cross Country Champion Josh Blevins in the Under 13 boys Championship. Josh has steadily built up a fearsome reputation this winter, culminating in his Northern victory but we must never forget that he is still only 13 years old and there was no expectation placed on his shoulders. It really was a case of ‘go out and give it your all and lets see where you end up’. 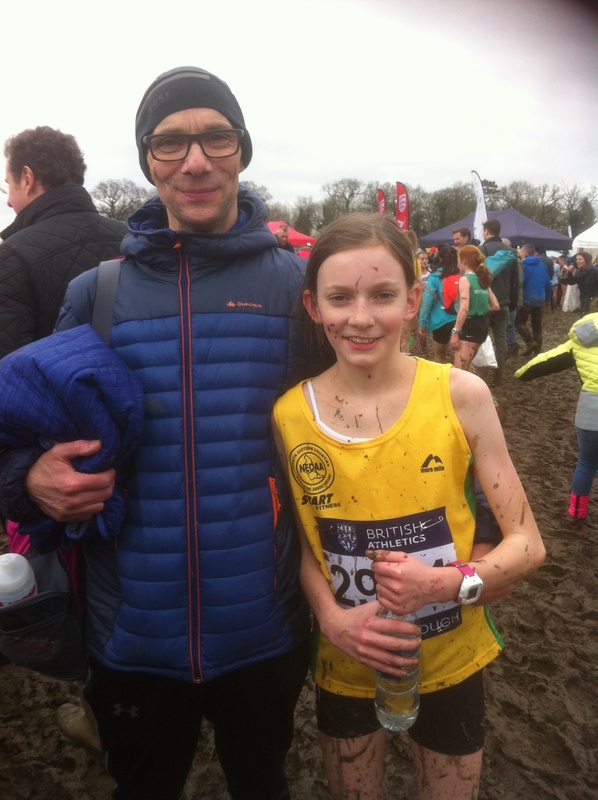 With 14 out of the first 15 from the National Cross Country Championships toeing the line, family and supporters simply did not know what to expect. So it was a mixture of sheer astonishment and joy as mam Karen shouted ‘He’s in 2nd!!!!! !’ as the leaders entered the finishing straight. Always in the leading group of 4 (which consisted of Josh and the first 3 from the National Championships), he hung on valiantly as National Champion Will Rabjohns, from Poole Harriers and representing Dorset, made the break with just under half a mile to go. Josh just held off the fast finishing Zena Saez of Bedford on the line to earn the silver medal. Fourth place went to North East Champion and big rival and friend of Josh, Chris Perkins of Birtley. With two in the first four, the North East easily won the team championship. With Josh having his Grandparents there to support him, as well as the unwavering support and encouragement he gets from parents James and Karen (as well as brother Matt who spent the day carrying numerous bags and kit without one word of complaint), dare I say there was a tear or two as he collected his medals at the presentation…..
Next up was Issy Robinson in the U17 ladies Championships. 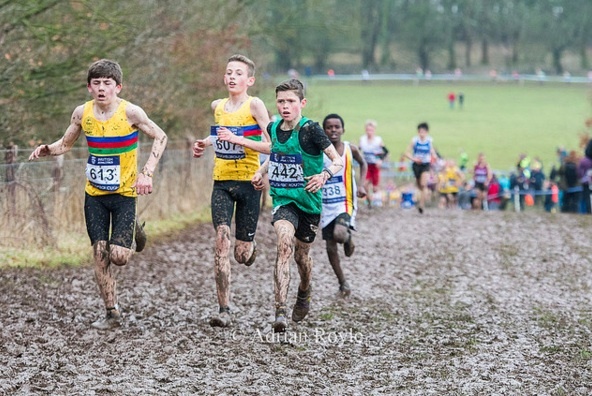 With the race being the fifth on the timetable, the course really was churning up and by the time the gun went, it was nothing short of a mud bath! 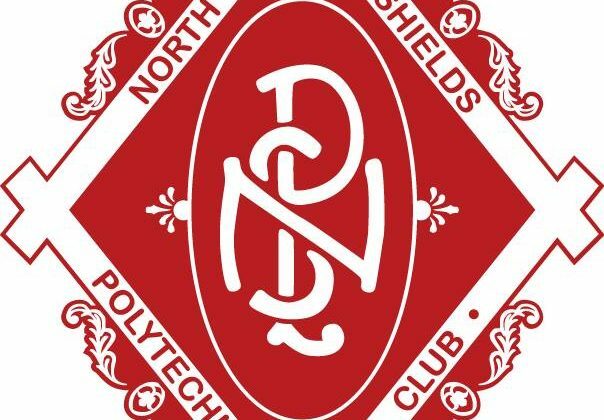 Issy confirmed her place in the team after finishing 4th at the North Easterns and then 5th North East counter at the Northern Championships. She is no stranger to this level of competition, this being the 2nd time she has represented the North East at these Championships and she has also ran in three English Schools Championships. 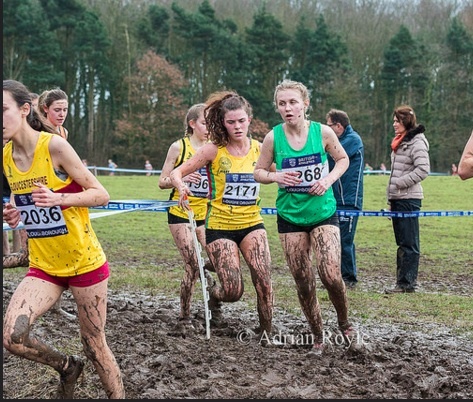 After a somewhat manic start, the Phil Hayes coached athlete found her rhythm and steadily worked her way through the mud and sludge to finish a creditable 158th, just missing out on being a team counter for the North East but providing solid back up. 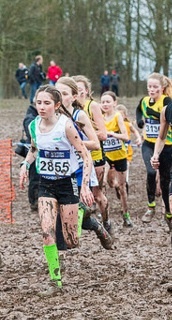 By the time Lily Robson competed in the U13 girls Championship, more than 1500 athletes had raced around the course. It was now 100% mud and only the strongest would survive. Lily’s development this season has been nothing short of incredible. Before Saturday she had competed at club level at numerous Harrier League events as well as a few junior fell races. 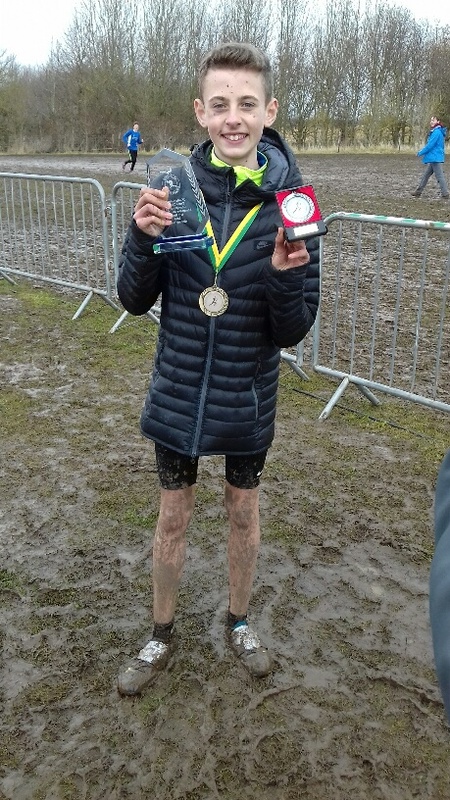 Remarkable improvement has now established the 13 year old as one of the top cross country runners in the North East (as well as one of the smallest!) and it was no surprise that she was a bag of nerves before the start. However, anyone that knows Lily will know that despite her small frame she is one of the toughest young athletes around. Full of determination, grit and heart, you always know what you are going to get with Lily – 100%! With proud parents Garry and Susie, as well as twin brother Harry, around the course cheering her on and big brother Will waiting for the result back home, Lily did exactly what she always does – got stuck in, was not fearful of anyone, never gave an inch and finished like an absolute train. Lily finished in 168th position (out of more than 300 County standard runners), 6th from the North East and less than 30 seconds behind North East bronze medalist Gabby Hall from Darlington. A real amazing effort. It was great to see the Poly represented at these Championship and certainly a proud day for our club. 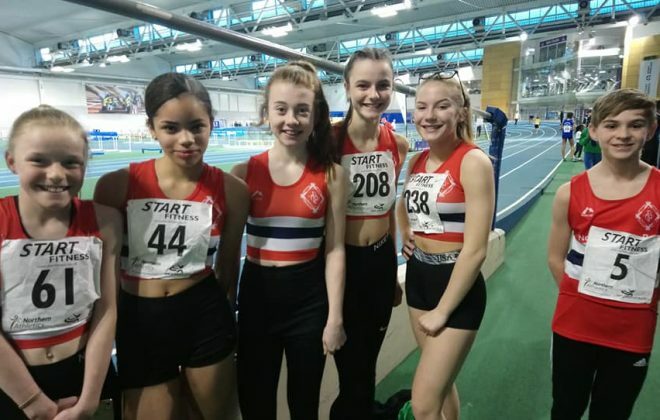 The club’s ethos for young athletes is very much based around hard work, while making sure the athletes are happy and enjoy training at the same time. It seems to be working and let’s hope we can continue to have Poly athletes competing at this level in the future. At the end of the day, the young athletes are the future of the club and while we develop the talent that we have, we must never forget to celebrate the success they achieve along the way. Big thanks must also go to the supporters, friends and family who made the long trip to Loughborough, endured the treacherous conditions but provided vital support and encouragement.